The Deep, as Asimov describes in his autobiography, was his attempt in 1952 to explore the far edge of science fiction, to see how iconoclastic he could be and still sell his story. He envisions a world in which mother love is considered obscene. Sucker Bait originated as a project (initially undertaken with two other authors) to present alternative stories predicated upon a common situation, in this instance, a planet with two suns. 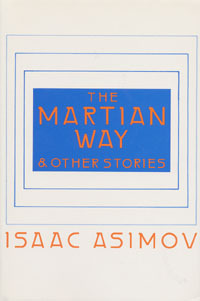 The Martian Way, a classic of the genre, is a prime example of science fiction's ability to deal with far frontiers on one level while remaining quite relevant to the here-and-now on another. This is a story of Martian colonists hindered in solving their problems by the intervention of a politician reminiscent of Senator Joseph McCarthy. These three plus the story Youth form a quartet that ably represents science fiction at its best.